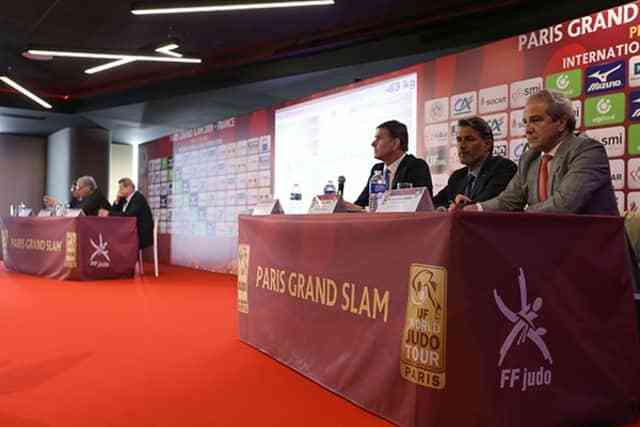 The IJF World Judo Tour has settled in France this week for the Paris Grand Slam, one of the most lauded events on the international calendar, as the AccorHotels Arena will be transformed into a theatre of judo on Saturday and Sunday. Following a highly-regarded season opener in Israel at the Tel Aviv Grand Prix, the attention now falls on Paris and its two-day supershow which will see Olympic and world champions in action while hundreds of hopefuls will look to make a name for themselves on one of the highest stages in the sport when judo is at the centre of the sporting landscape in France this weekend. The Paris Grand Slam is the hottest ticket in town with an expectant French crowd counting on glory from their star-laden team including triple world champion Clarisse AGBEGNENOU (FRA) who will be in -63kg action on Saturday. Fans will travel from all over the world to attend the revered competition with plenty to cheer for as 97 countries will take part in France as 573 judoka battle it out with the aim of winning one of the 14 gold medals at stake at the first major of the season. The total number of comeptitors is the second highest figure in the history of the tournament with 584 judoka setting the record in 2012. 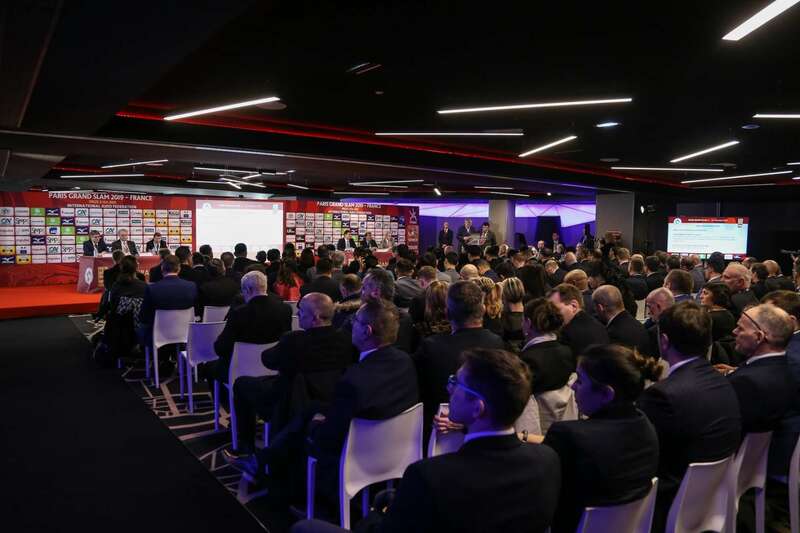 Mr. Naser AL-TAMIMI, IJF General Treasurer, made the opening address at the draw which took place on Friday afternoon at the AccorHotels Arena. 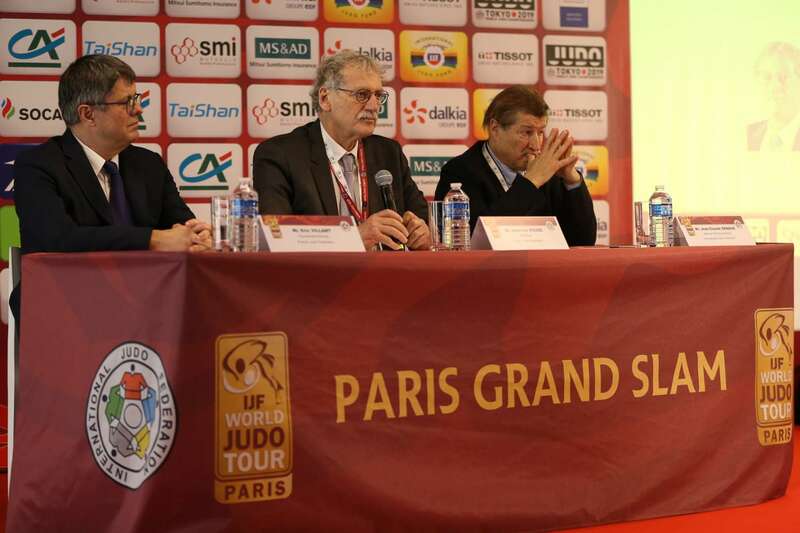 Mr. Jean-Luc ROUGÉ, French Judo Federation President and IJF General Secretary, spoke on behalf of the organising committee. Rio 2016 Olympic bronze medallist KONDO Ami (JPN) needs to start her year with a win as she looks to make up ground on fellow former world champion TONAKI Funa (JPN). World Judo Masters winner Distria KRASNIQI (KOS) stunned KONDO in 13 seconds in December and an intriguing rematch could be on the cards in France. Olympic bronze medallist GALBADRAKH Otgontsetseg (KAZ) is a two-time Grand Slam winner and will be her country’s leading medal hope in Paris. World Judo Masters gold medallist TSUNODA Natsumi (JPN) took silver in her Paris debut in 2017 and followed up with a fifth-place finish last year. Japan’s number three in the -52kg category will be joined in action by world silver medallist and former world champion SHISHIME Ai (JPN) who is regarded as her country’s number two behind of teen wonder ABE Uta. London 2012 Olympic bronze medallist Charline VAN SNICK (BEL) will be a contender while Olympic silver medallists Odette GIUFFRIDA (ITA) and JEONG Bokyeong (KOR) could also enter the medal equation. World Judo Masters silver medallist Nora GJAKOVA (KOS) will believe that this is her year to open her Paris Grand Slam medal column at her eighth attempt. European champion GJAKOVA has been on a roll of late for Kosovo and will be aiming to repeat her Abu Dhabi Grand Slam victory which was her first Grand Slam triumph. Jessica KLIMKAIT (CAN) blew the Tokyo 2020 race wide open in Canada with a sublime win at the Osaka Grand Slam and ended her season with bronze at the World Judo Masters. KLIMKAIT is now ranked fifth in the world just ahead of teammate and world bronze medallist Christa DEGUCHI (CAN) who will also compete on the opening day in Paris. Rio Olympic champion Rafaela SILVA (BRA), Rio 2016 Olympic bronze medallist Telma MONTEIRO (POR) and London 2012 Olympic bronze medallists Priscilla GNETO (FRA) and Automne PAVIA (FRA) will all be in the medal frame. World champion Clarisse AGBEGNENOU (FRA) has won her home Grand Slam on four occasions and will be the darling of the AccorHotels Arena this weekend. Olympic silver medallist AGBEGNENOU is unbeaten since 2017 with a run of 23 consecutive contest wins in individual competition. The French superstar’s arch-rival, Tina TRSTENJAK (SLO), Olympic champion and two-time Paris winner, is never one to back down from a challenge and will be keen to take on AGBEGNENOU in her homeland. World Judo Masters silver medallist NABEKURA Nami (JPN) and Osaka Grand Slam bronze medallist NOUCHI Aimi (JPN) will also be in the mix in the -63kg category. World Championships silver medallist Marie-Eve GAHIE (FRA) won bronze a year ago and will be confident that 2019 will see her record her first Paris Grand Slam victory. The world number two leads a star-studded category into action on day two and will be pushed all the way at the AccorHotels Arena. World Judo Masters bronze medallist Sanne VAN DIJKE (NED) started her season with bronze at the Tel Aviv Grand Prix in January and will be targeting a second Grand Slam gold medal. World Judo Masters gold medallist NIIZOE Saki (JPN) is already ranked fourth in the world and could go all the way for Japan. Tel Aviv Grand Prix gold medallist Anna BERNHOLM (SWE), former world number one Maria PORTELA (BRA), Olympic bronze medallist Sally CONWAY (GBR) and World Championships bronze medallist ONO Yoko (JPN) all have the tools to secure a place of the medal podium on Sunday evening. Osaka Grand Slam gold medallist SATO Ruika (JPN) took silver at the season-ending Masters in China and as a result has earned her first trip to Paris since 2017. The world number two is a five-time Grand Slam winner and took silver at France’s Grand Slam in 2017 and 2015 and bronze in 2013. SATO is in contention for Tokyo 2020 selection along with former world champion UMEKI Mami (JPN) who also makes the trip to Paris. World Judo Masters bronze medallist Natalie POWELL (GBR) needs to bounce back from a disappointing fifth-place in Tel Aviv and could add to her one medal from the showpiece event – bronze in 2016. European champion Madeleine MALONGA (FRA) and double Olympic medallist Audrey TCHEUMEO (FRA) are locked in a battle for Tokyo 2020 selection but both will be urged on by the home faithful. Double Olympic bronze medallist Mayra AGUIAR (BRA) has not won an IJF World Judo Tour event since claiming her second world crown in August 2017 and Paris is the ideal location to rediscover her class. Heavyweight legend Idalys ORTIZ (CUB) took silver at the Masters in December and is on the verge of making a bid for a fourth Olympic medal at the Tokyo 2020 Olympics next year. ORTIZ has won every major accolade in the sport and has earned six medals at the Paris Grand Slam but never gold. While the Cuban star aims to add to her legacy on day two, the world’s elite heavyweights will be out in force in the host city of the 2024 Olympics. World Judo Masters winner SONE Akira (JPN) will be a leading contender along with Tel Aviv Grand Prix gold medallist Iryna KINDZERSKA (AZE), 2018 Paris Grand Slam winner KIM Minjeong (KOR) and world number 13 Anne Fatoumata M BAIRO (FRA). Three-time and reigning world champion TAKATO Naohisa (JPN) has never tasted defeat in Paris with three gold medals to show for three outings in France (2013, 2015 and 2017). The Olympic bronze medallist lost his two-year undefeated streak in November with a round two elimination at the Osaka Grand Slam. World Judo Masters bronze medallist DASHDAVAA Amartuvshin (MGL) will be a judoka to watch along with the Kazakh duo of former world champion Yeldos SMETOV and two-time Grand Prix winner Gusman KYRGYZBAYEV. Two-time and current world champion ABE Hifumi (JPN) will make his second appearance at the Paris Grand Slam and will be confident of repeating his 2017 win. The international crowd will be thrilled to see ABE among the world-class -66kg field which also houses former world bronze medallist Vazha MARGVELASHVILI (GEO), World Judo Masters silver medallist Baruch SHMAILOV (ISR) and world bronze medallist Georgii ZANTARAIA (UKR). France’s former world bronze medallist Loic KORVAL will make his return to IJF duty after a two-year hiatus. London 2012 Olympic champion and Rio 2016 Olympic bronze medallist Lasha SHAVDATUASHVILI (GEO) won bronze at the World Judo Masters and will be bidding for a second Grand Slam title on Saturday. The Georgian star is well on course to challenging for a third Olympic medal in as many Games next year. Former world champion HASHIMOTO Soichi (JPN) endured a difficult 2018 by his high standards as he missed out on gold at his three IJF appearances. HASHIMOTO finished second at the Hohhot Grand Prix and took silver at the Worlds as he conceded his crown before missing the podium all together at the Masters. The Ippon Hunter will need to quickly get back to his best with Olympic champion ONO Shohei in red hot form and set to open his 2019 campaign in two weeks time at the Düsseldorf Grand Slam. Akil GJAKOVA will be battling to retain the Paris title but will have it all do with world bronze medallist Hidayat HEYDAROV (AZE), World Judo Masters silver medallist Arthur MARGELIDON (CAN) and Olympic champion Fabio BASILE (ITA) for company at -73kg. World champion Saeid MOLLAEI (IRI) has not medalled in his three events since he was crowned the second Iranian judoka to win a world judo title. MOLLAEI finished fifth at the Abu Dhabi Grand Slam in October and suffered shock second round exists at both The Hague Grand Prix in November and the Masters in December. The owner of the red backpatch at -81kg will be aiming to rebound in France in a category which will be replete with winners on day two including Olympic champion Khasan KHALMURZAEV (RUS), World Judo Masters gold medallist SASAKI Takeshi (JPN) and European champion and Tel Aviv Grand Prix winner Sagi MUKI (ISR). World Judo Masters silver medallist TOTH Krisztian (HUN), world silver medallist Ivan Felipe SILVA MORALES (CUB) and former world champions GWAK Donghan (KOR) and Avtandili TCHRIKISHVILI (GEO) will all participate with fireworks guaranteed in one of the strongest divisions in the competition. Home hopes will rest largely on Tel Aviv Grand Prix gold medallist Axel CLERGET (FRA) who will be craving a shot at winning Grand Slam gold for the first time in his late blooming career. Olympic and world silver medallist Varlam LIPARTELIANI (GEO) is coming off Masters glory in December and will be tipped to complete his Paris Grand Slam hat-trick. Georgia’s key man is a six-time Paris Grand Slam medallist and has left the Bercy as the winner on two occasions (2013 and 2015). World champion CHO Guham (KOR) was an early casualty at the Masters at the hands of IIDA Kentaro (JPN) and has the opportunity to show the immense Paris crowd his quality as he bids to live up to his red backpatch. Defending champion Michael KORREL (NED) and former world champion and Osaka Grand Slam winner WOLF Aaron (JPN) are potential winners while France will look to the experienced duo of Olympic bronze medallist Cyrille MARET and Tel Aviv Grand Prix winner Alexandre IDDIR for inspiration in the -100kg category. Defending champion KAGEURA Kokoro (JPN) can stake his claim to being his country’s top heavyweight if he can produce a similar performance in 2019 while World Judo Masters bronze medallist Tamerlan BASHAEV (RUS), Osaka Grand Slam winner Henk GROL (NED) and Asian Games gold medallist KIM Sungmin (KOR) are all capable of being crowned the 14th and final gold medallist at the 2019 Paris Grand Slam.